Teletalk Happy New Year Offer 2019! Hello Dear, welcome to Teletalk 299 TK recharge Happy New Year 2019 Bundle Offer. 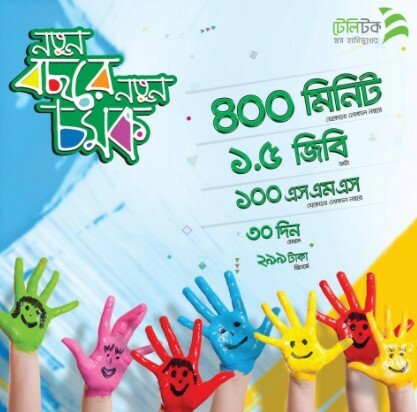 The Bangladesh Government telecommunication company “Teletalk” brings a big offer to celebrate 2019 Happy New Year for their valuable customers, whose name is Teletalk Happy New Year 299 TK recharge Comok Bundle Offer. All the Teletalk connections users are eligible to enjoy Teletalk New Year 2019 Offer. Under this Bundle Offer, customers will be eligible 400 Minutes any number talk-time, 1.5 GB Internet & 100 SMS for 30 days after recharging 299 Taka. If you are a Teletalk customer and want to enjoy Teletalk New Year 2019 Offer, just follow the below content. To activate the Teletalk Happy New Year 2018 Bundle Internet, SMS, Minutes Offer, customer need to Dial USSD code *111*299# or recharge exact 299 Taka. VAT + SD + SC is included in recharge amount 299 Taka. To check the remaining balance of Teletlak 2018 New Offer, just dial USSD code *152#. The validity of Teletalk 299 TK Happy New Year 2018 Bundle Offer 30 Days. Customers use the 1.5 GB internet, both 2G,3G area networks and all Minute, SMS, Internet uses times 24 hours. Thanks for staying with us a long time and visiting Teletalk 299 TK Recharge Happy New Year 2019 Bundle Offer content. If you have any question about the Teletalk New Year Offer? Just comment here. We reply as soon as possible.